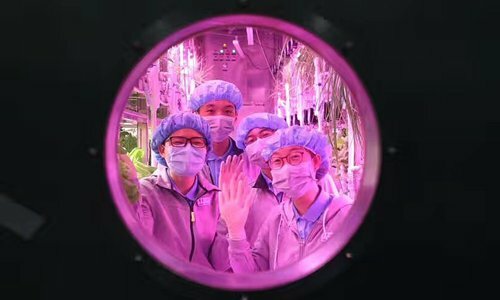 Four college students in Beijing share a unique reason they're unable to make it home for Spring Festival this year; they are participants in simulated moon colony. Space technology researchers at Beijing's Beihang University began the year-long experiment on the campus on May 10, 2017, amid China's increasing ambitions to explore space. Eight students volunteered to live on the Yuegong-1 facility, nicknamed the Moon Palace. They are physically isolated from the outside world, and completely dependent on the facility's eco-system. China expects to launch 40 rockets into space in 2018, likely more than Russian and the US combined, said experts. China also announced plans to send a lunar lander to the far side of the moon later this year, first in the world. The country's future moon missions include bringing samples of the moon back to earth. Four of the students first spent 60 days in the Yuegong-1 before being rotated out and a second group of four entered the facility where they lived for 200 days. In late January, the first group of four took their second turn in the facility. This group will spend the remaining 105 days of the experiment in Yuegong-1. The program is aimed at testing how a closed eco-system can support human life with only minimal replenishment from the earth, a key to long-term survival in space or on another celestial body. This is the second isolation experiment under the Yuegong program. The first was conducted in 2014 when participants lived for 105 days in isolation. Officials from Beihang University, where the facility is located, say the current experiment is running smoothly. Team members living in Yuegong-1 are in good health and have been growing vegetables and other plants. The volunteers will also be tested on their ability to respond to emergencies to test limits of the "moon palace." Liu Hong, chief architect of "Yuegong-1" and a professor of Beihang, said that after the current program is completed they will apply to be included in China's moon and mars programs. The goal will be to develop living facilities for future deep space exploration that can provide oxygen, water and food for the crew. The Yuegong's 2014 test run provided 100 percent of required oxygen and water and 55 percent of crew's food needs. Most of the volunteers in the Yeugong missions were senior college students at Beihang. Liu Guanghui, the leader of the second team in the current experiment, said he was both physically and mentally healthy during his 200 days in Yuegong-1, during which his team conducted daily science experiments without a day off. When the volunteers' mission was completed they were given a health check-up and quarantined at the campus hospital. Another participant Chu Zhengpei said all team members were subjects of experiments. Their hair, saliva, nails and excrement were all collected for study. The psychology, emotions and even the intestinal bacteria of the participants were monitored. During their stay in the facility they encountered three unexpected power outages, which became chances to test their emergency management capability. The participants has some real-world worries while they were in isolation. "My classmates were all busy looking for a job. I have missed the job-hunting season and the civil service exam," said one of the volunteers Wang Wei. Chu, who spent 200 days locked in the facility, was happy to be "back on earth," but said she will miss regular, self-sufficient life in isolation, away from the hectic urban life.